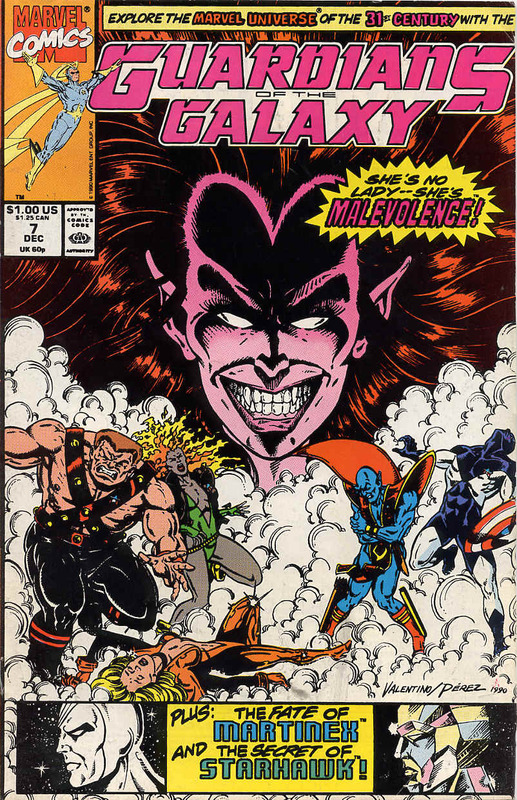 Guardians of the Galaxy #7 was cover dated December 1990 and was on sale in October 1990, sharing the spinner rack with Hawkworld Annual #1, Incredible Hulk #376, L.E.G.I.O.N. 90 #22, Quasar #17, Superman #50 and X-Men Animation Special #1. This is an oddly laid out issue. There are two running stories here, which dovetail at the end into one story. Since that’s an odd read I’m going to look at each story seperately and then the finale, so it’s sort of a three part analysis. Charlie and Nikki find a ship full of suspended animation chambers with tubes leading to another room. The beings in the chambers look gaunt and drained. In the other room is another chamber containing a red skinned woman in red clothes, looking dark and devil-like. She wakes and rises and seems to drain energy from Charlie. 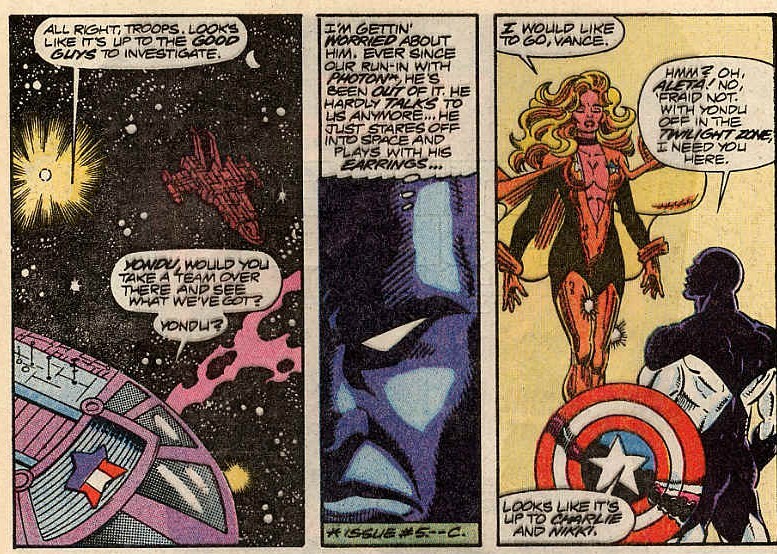 She demands the child from Nikki once she learns they are the Guardians of the Galaxy, realising they don’t know what she means she flees the ship in a halo of flame and lands on the Captain America II. 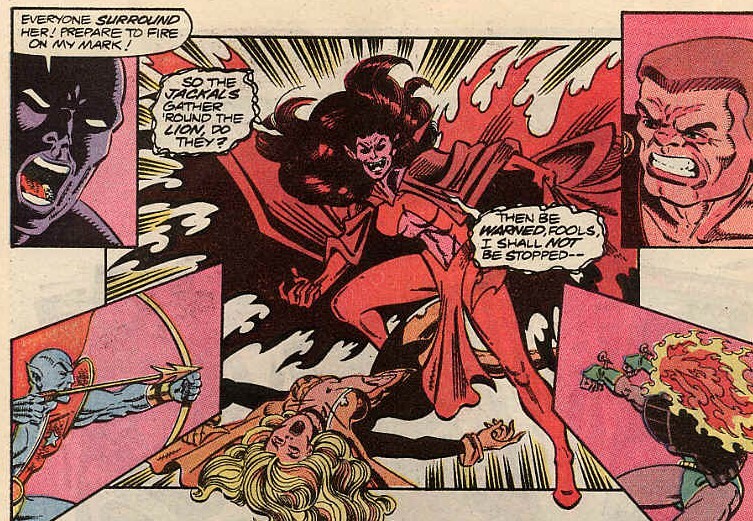 She attacks Vance and Aleta who the red woman describes as her rival. She then flies towards sick bay. 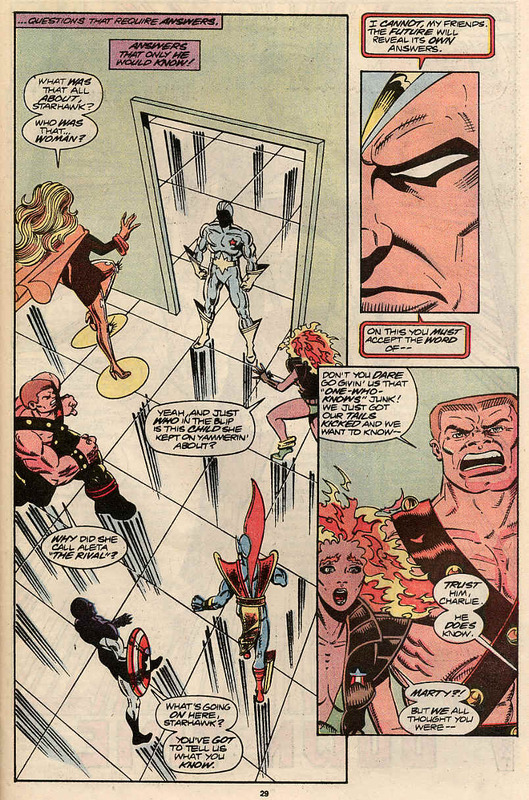 Nikki and Charlie return and with a cry of lets go Guardians, the team (now including Yondu) try to head her off. That’s where the story joins up with. Martinex is critical in sickbay and Starhawk is using his light powers somehow to heal him. 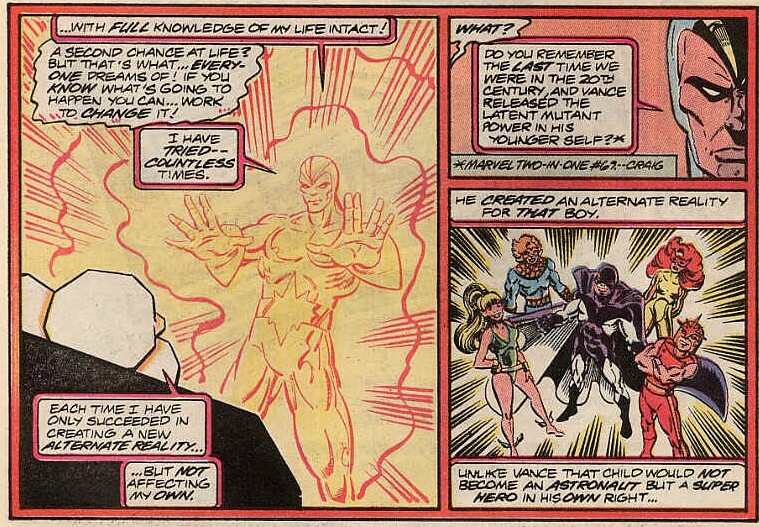 While this happens Martinex asks about the nature of Starhawks knowledge, why he is One Who Knows. 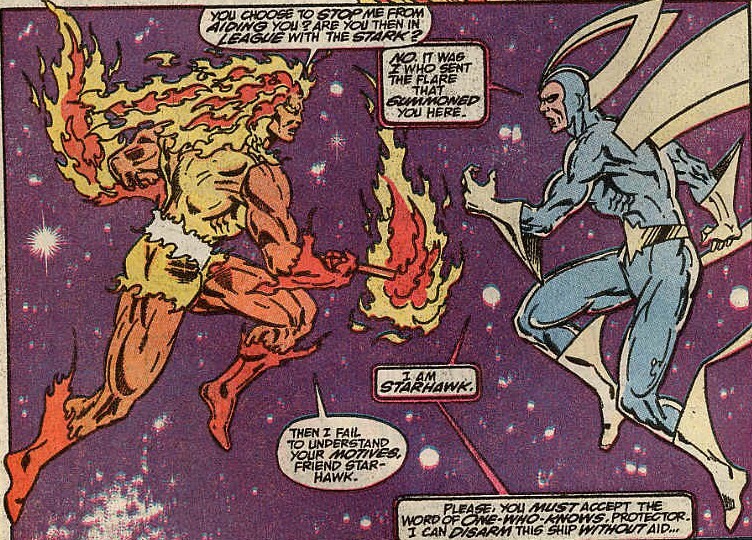 Breaking with tradition, Starhawk tells him. 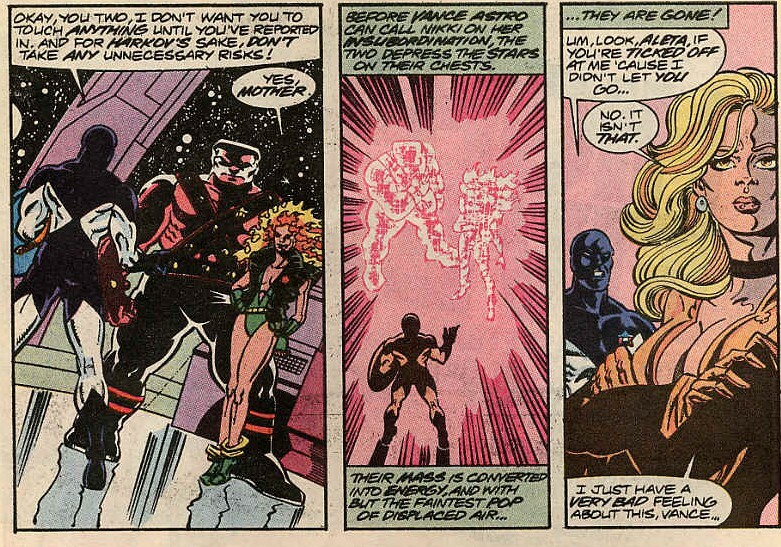 We’re treated to a recap of the previous origin of Starhawk, Martinex even mentions that Stakar and Aleta are sort of related, because NO ONE EVER MENTIONS THAT FACT. He then fills in the gaps relating to his and Aleta’s children. He tells Martinex that in the near future he will be expelled from the Guardians for a crime he will have no choice in committing and that after this, the team will travel to the 20th Century. It is at this point, that Starhawk’s consciousness will leave his body and re-inhabit his infant body, with all of his memory intact. Starhawk remembers he life as he has lived it several times over. There are variations, there are things that happen that he doesn’t remember, like Aleta and Starhawk separating so soon, but that is how he is One Who Knows, he remembers. When the tale is done, he stands and moves to the door, telling Martinex that a woman named Malevolence has come seeking someone. 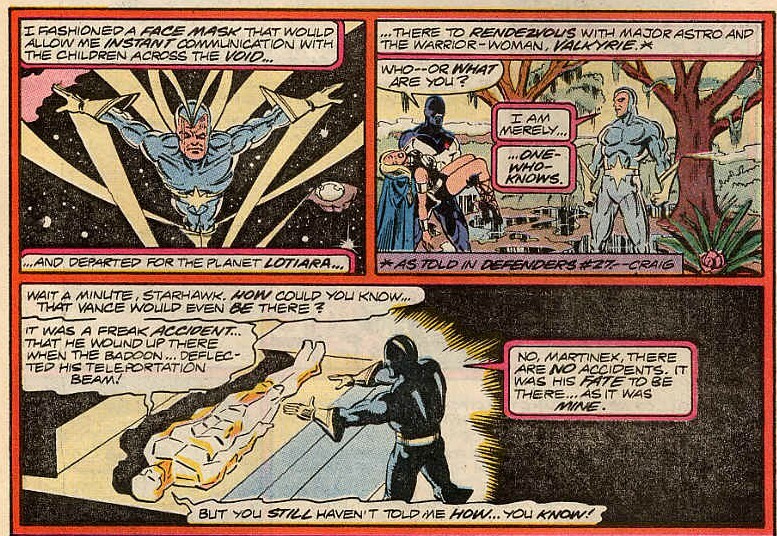 Starhawk intends to tell her that he isn’t there and believes that will send her on her way. 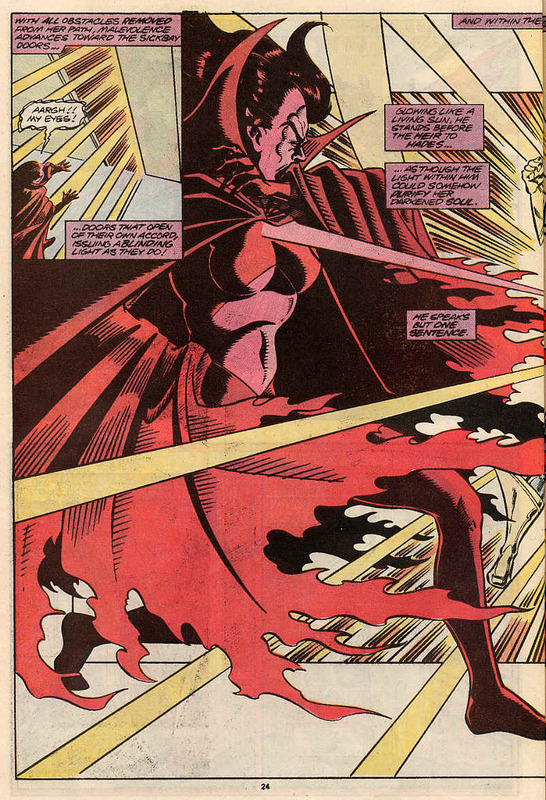 The red woman, whom we now know to be called Malevolence, gets to the sickbay and is driven back by the light of Starhawk, who informs her that the child she seeks isn’t with the Guardians, yet. 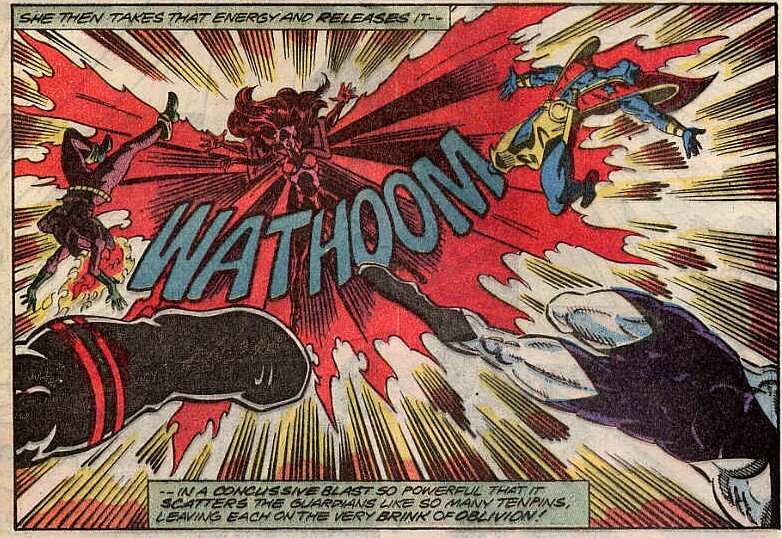 Malevolence calls out to her father and scolds him for sending her too soon and with another fire effect, she is gone. Starhawk tells the team that the future will reveal all and once again, no one is listening, until a healed and different looking Martinex appears at the door and says that the rest of the team trust Martinex and that they should trust that he believes Starhawk and this isn’t the end. 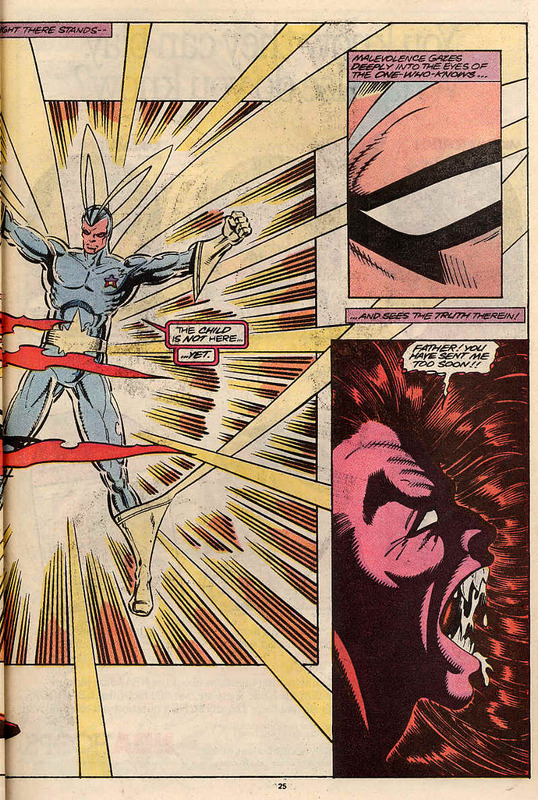 Notes: Yondu is still very much feeling the effects of his encounter with Photon. 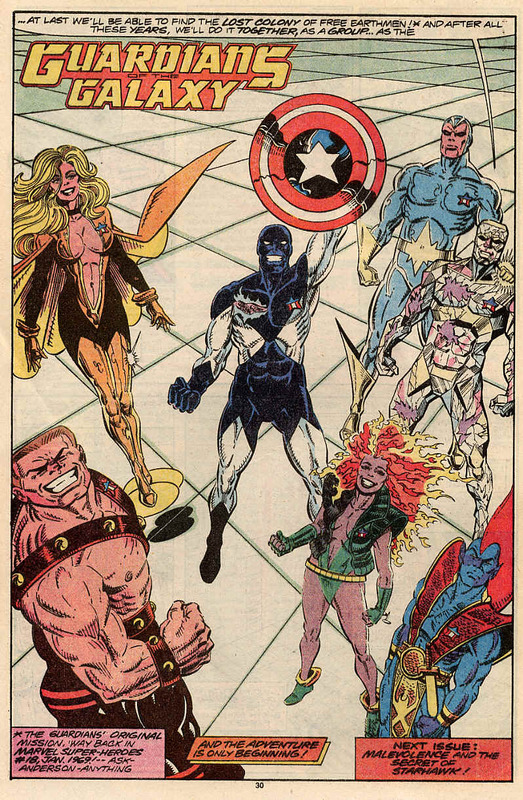 Vance Astro seems to have taken back command whilst Martinex is in sickbay, while few seem happy, no one seems to challenge it. Why does Vance need Aleta on the ship? I can think of a reason, but not a tactical one. Much of the origin recap is from Marvel Presents 9 to 11 with some added information filling in the gaps. The origin of his knowledge makes a lot of sense, especially relating to the things he doesn’t know. But it means that he knew how his life was going to go throughout all of it, including what would happen between him and his ‘sister’. Well that’s more than a little creepy isn’t it? Malevolence’s appearance gives a lot of clues as to who her father is, which is confirmed later. There is a reference to a child, also confirmed later, this issue is doing a lot of set up. Final note: I appreciate the split story structure, but felt it was a bit disjointed, the scenes with Martinex and Starhawk being a far stronger story. I do like Martinex’s new look, which although crystalline, is more organic and makes him more human in his expression. This was a fill in issue a little bit and serves as a sign of stories to come. I wouldn’t recommend this as a first issue, but it works as a companion piece to earlier and later issues. Guardians of the Galaxy 6 was cover dated November 1990 and was on sale in September 1990, sharing the spinner racks with Adventures of Superman #472, Cadillacs & Dinosaurs #1, Justice League Europe #19, Nomad #1, Question Quarterley #1 and Web of Spider-Man #70. 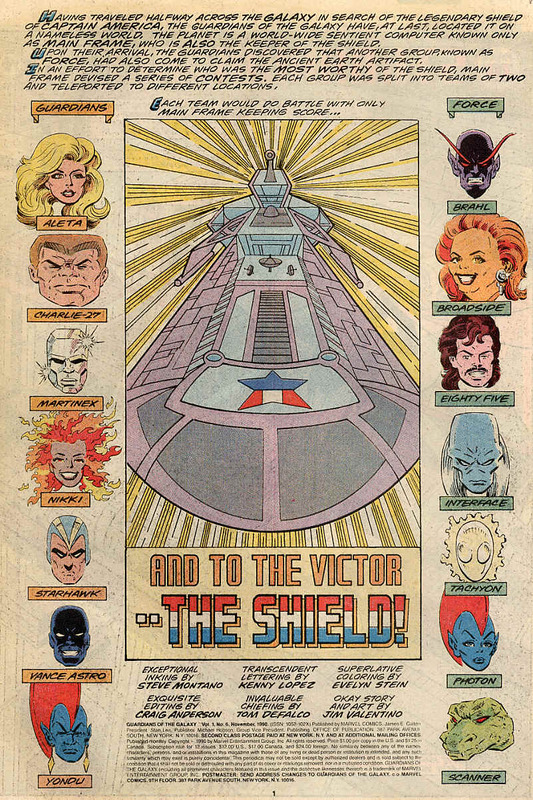 To the Victor, the Shield was written by and drawn by Jim Valentino and inked by Steve Montano and opens with Starhawk & Aleta teleported to a large indoor area. Before anything happens, Aleta decides now the is the time to unload to Starhawk about why she hates him so much. She blames him for the death of her children, not because he did it, but because he didn’t see it coming and prevent it. Whilst this arguement is going on Eighty-Five and Tachyon of Force arrive and start battling the two of them. Back in the holding area Starhawk arrives, seeing Aleta, Charlie-27, Nikki, Yondu and the unconscious form of Martinex waiting for him. Seeing that Martinex isn’t actually dead Starhawk points this out, getting more grief for being One-Who-Knows for doing so. 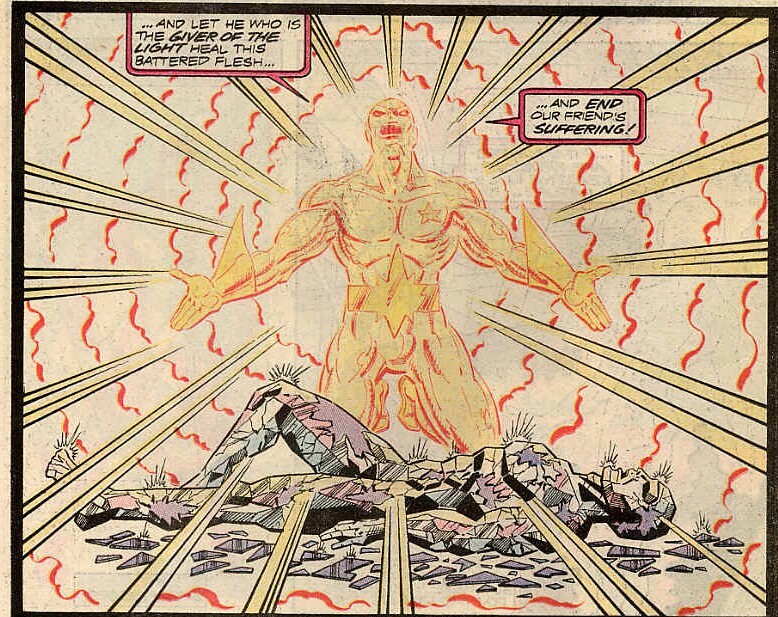 Undeterred he walks over to Martinex and using his light powers, heals him enough to start him breathing again. Nikki then calls for Mainframe to take them back to their ship, but instead he brings them to a meeting hall. Guardians of the Galaxy in one booth, Force in the other and between them Captain America’s shield. 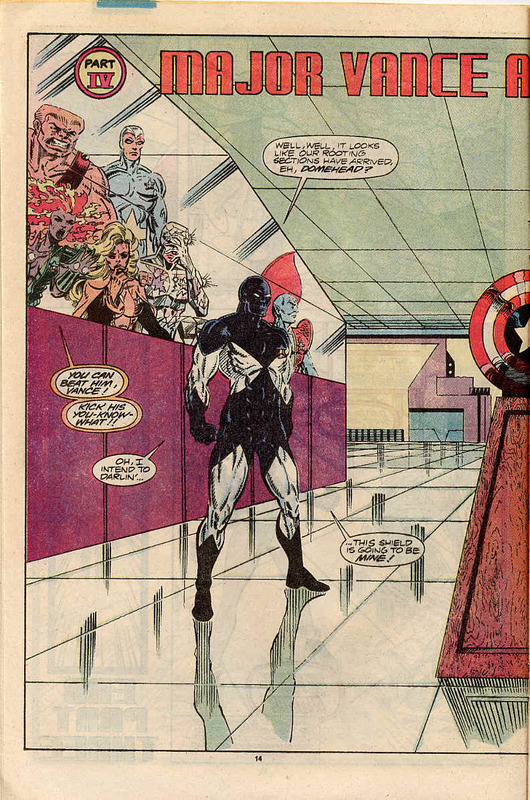 Standing in front of the booths are Vance Astro and Interface, ready for their match up. 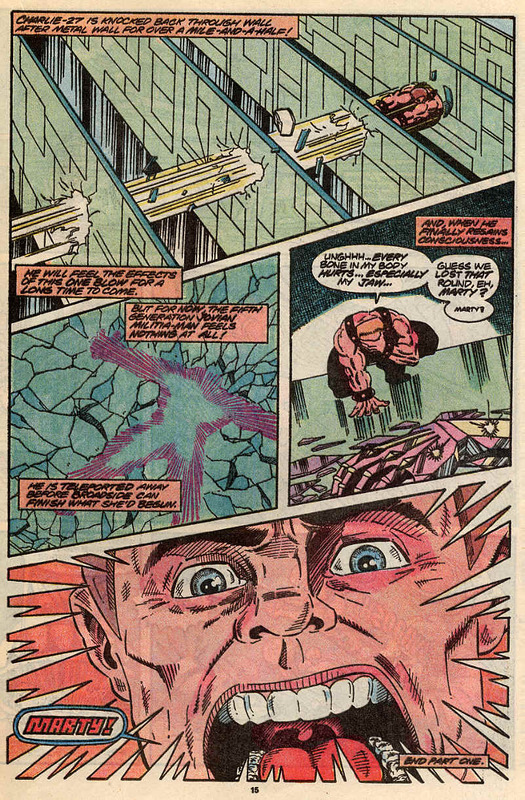 Before Vance can move, Interface transmutes part of his protective suit into helium, reopening his wound from #3. 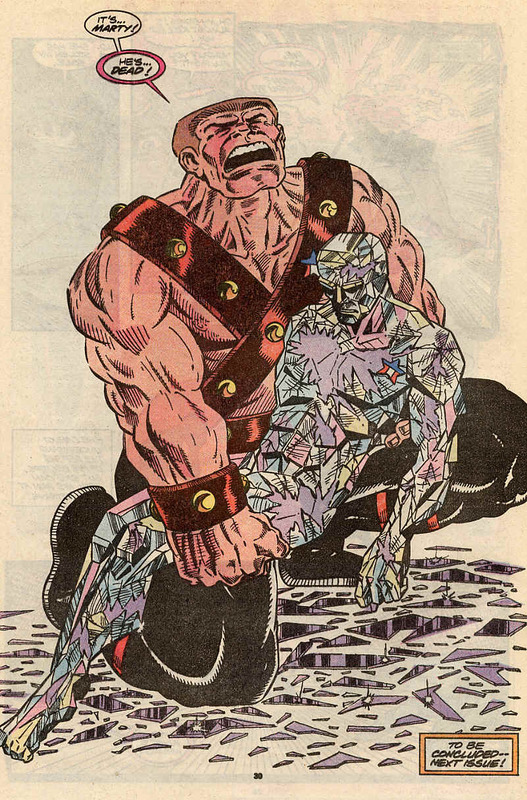 Dropped to his knees by the tremendous pain, Vance cannot stop Interface from grabbing the shield in triumph. 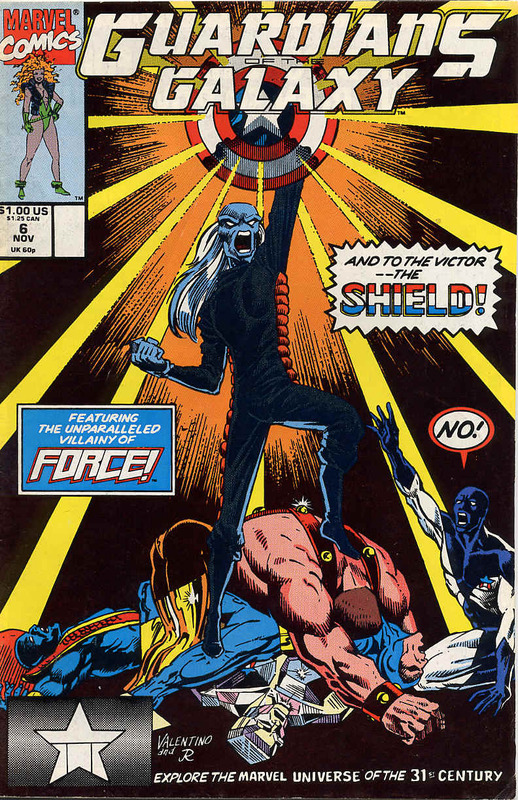 Interface holds the shield up and demands the obedience of the Guardians who, well don’t agree. 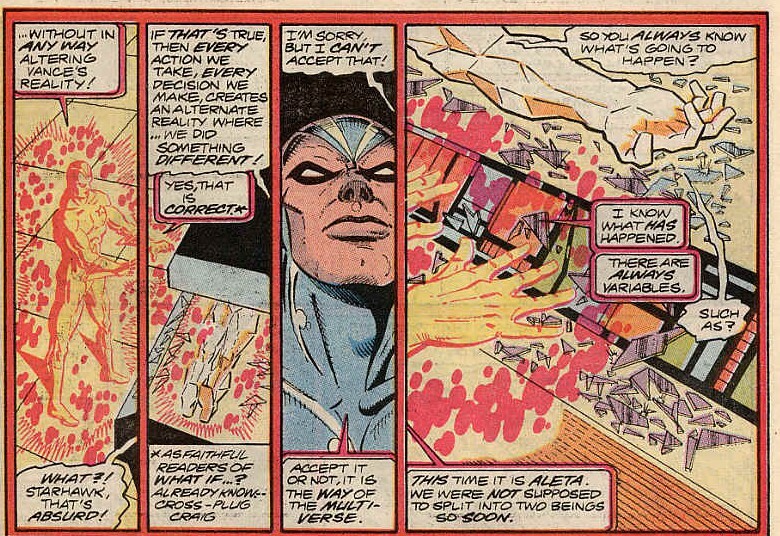 Interface casts the shield aside, angered by it’s lack of power. Vance can see it’s power and despite his pain and all that has happened, he rises walks over to the shield and holds it aloft. 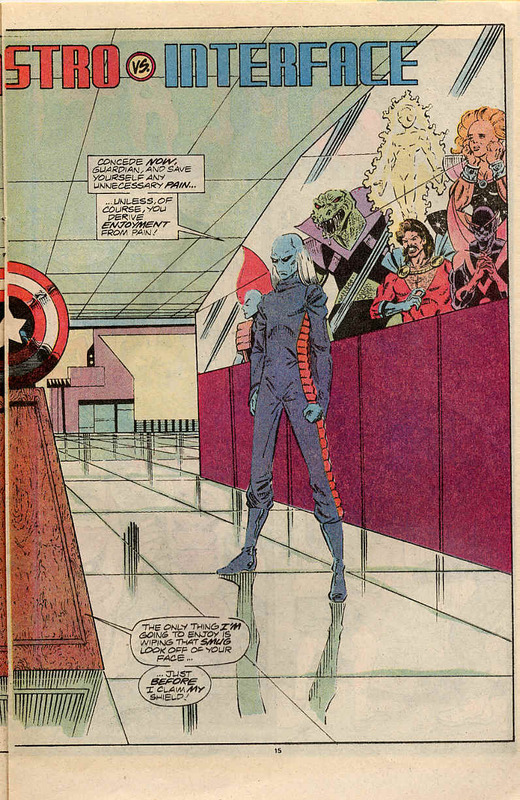 His ideals restored, he stands prouder than ever before holding the shield once owned by the inspiration to the Guardians of the Galaxy, Captain America. 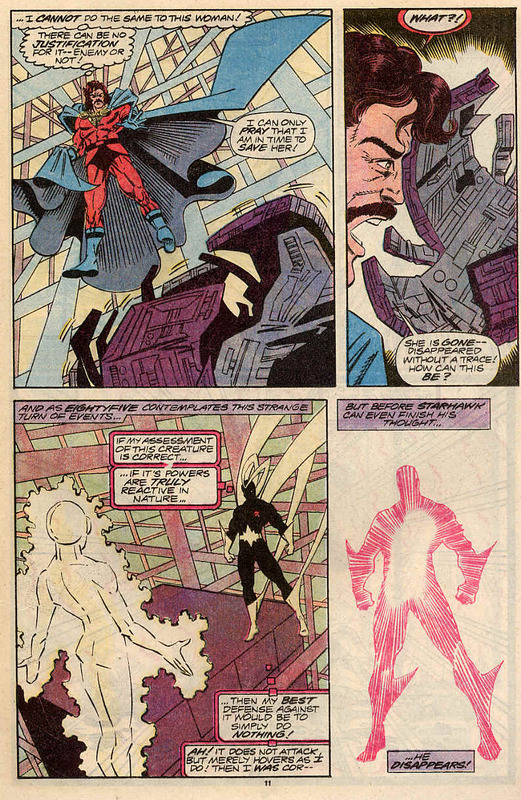 Force are then teleported away and it’s time for the big reveal, Mainframe is the disembodied mind of the former Avenger, the Vision. The Vision pretty much admits he wasn’t going to give the shield to Force and used the match ups to test the weaknesses of the Guardians. Martinex’s was a test of courage and he passed. Charlie’s a test of cunning and he failed. Aleta and Nikki were tested on mercy and compassion and also failed. 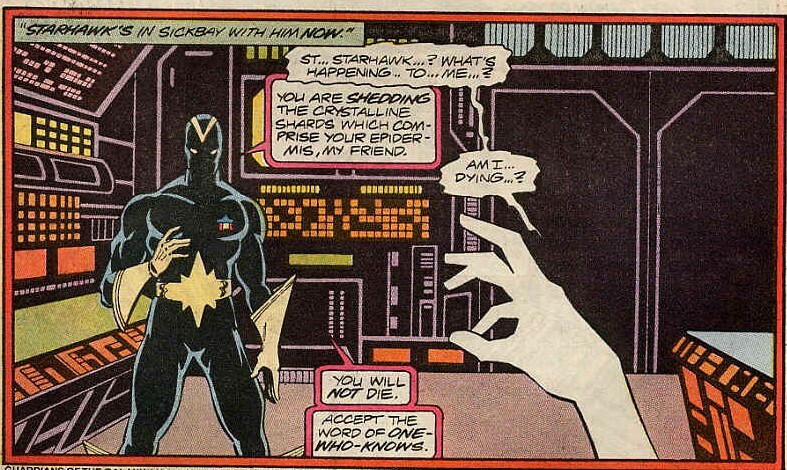 Yondu’s test was one of honour and his was a pyrrhic victoy and Starhawk was tested on faith and passed. 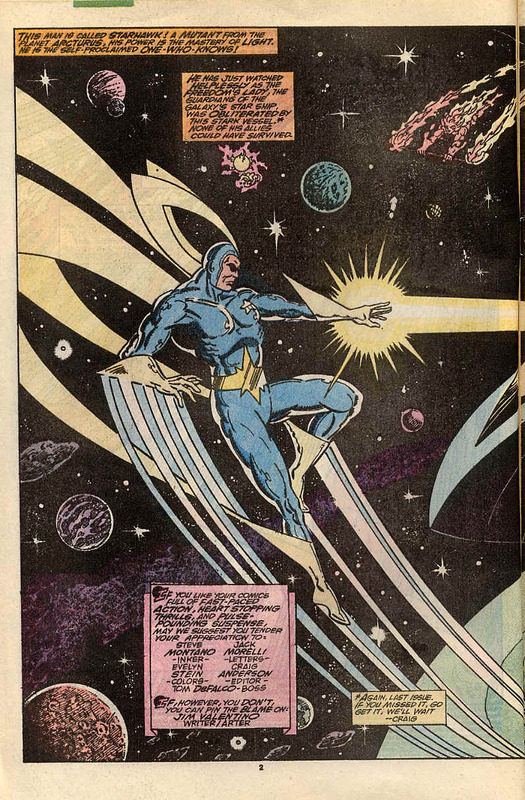 The Vision also reveals that he travelled to this world looking for the lost colony of mutants who left Earth during the War of the Worlds, he didn’t find them and merged with the planet to access it’s systems. He later on found the colony, but is now no longer able to go there. The Guardians take this mission on after posing for a picture. Notes: This is the end of the first arc of the title. Aleta gives a reason for changing her outfit and her coldness toward Starhawk. Despite once being a Superhero, Mainframe uses Force, a pirate crew, as part of his plan and when their done with lets them escape. The Guardians have had adventures yet to be told about, which is hinted here. 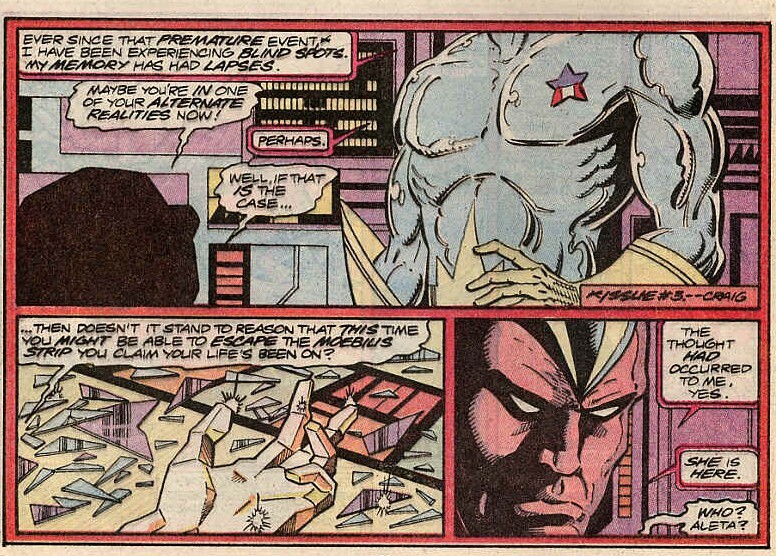 This issue does try to make Starhawk a more sympathetic character, showing his cold and calculating demeanour as a surface, deep down he is a caring man, torn by the loss of his children and who wastes no time in using his power to heal Martinex. Their tests reveal something interesting, usually in fiction of the women being more compassionate and merciful, which to be honest is a little stereotypical or sexist than needs be. Stuff happens to people and it can often leave scars, Aleta and Nikki lack compassion in Mainframe’s eyes, but you can understand why. Final notes:Whilst the art is not as impressive as the last issue, the writing is much better. 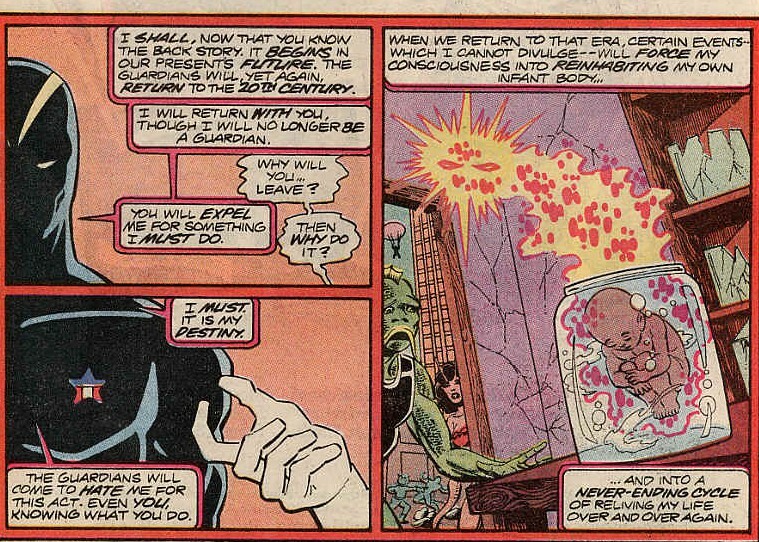 This issue ties up the last plot thread from the older appearances with the finding of the last colony of humans. 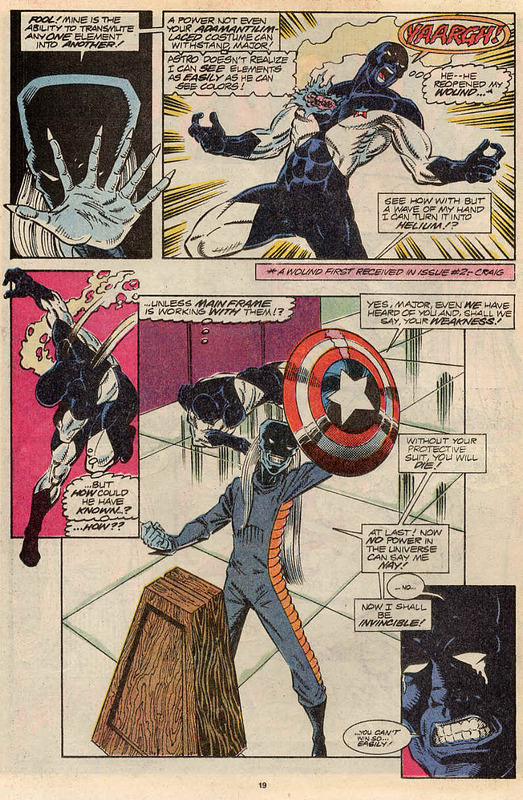 Vance Astro shrugs off his self-pity and has his hero moment and claims the shield of Captain America. 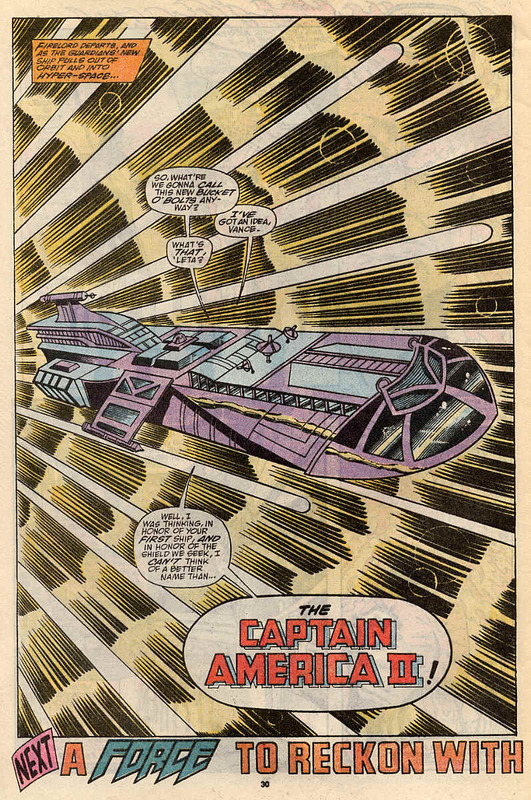 Vance’s idolising of Cap does become one of his defining characteristics and the shield changes him for the better. Over-all a solid issue and a satisfying conclusion to the first arc and now the Guardians can get on with their adventures. Guardians of the Galaxy #5 was cover dated October 1990 and was on sale August 1990, sharing the spinner racks with Action Comics #657, Amazing Spider-Man #340, Captain Atom #45, Foolkiller #1, Legion of Superheroes #12 and Uncanny X-Men #289. 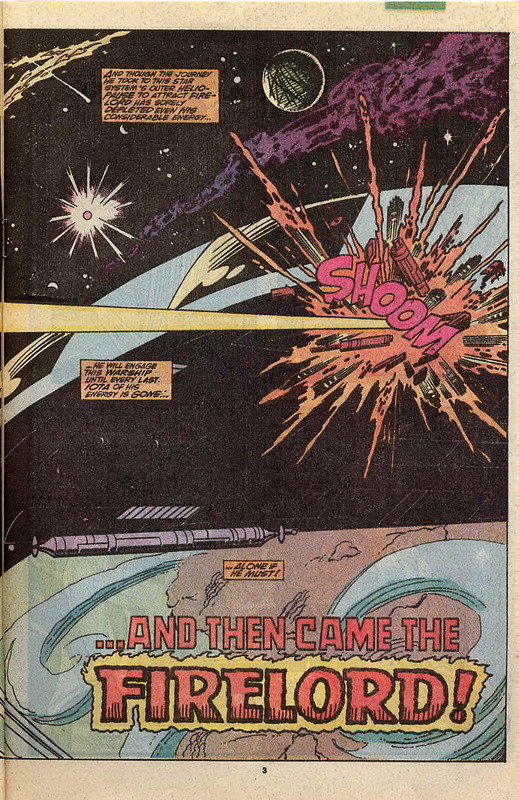 A Force to be reckoned with was written and drawn by Jim Valentino with inks by Steve Montano and opens with the Guardians of the Galaxy arriving at the world they were told about in the last panel of the last issue. It’s now a month later and they’re on the planet being addressed by a disembodied voice referring to itself as Mainframe. 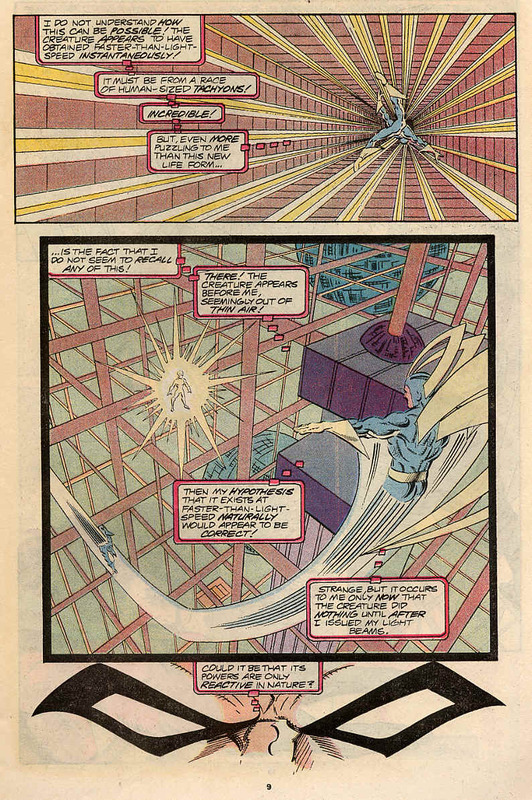 Mainframe identifies each Guardian seperately and tells them that they must face Force to be able to lay claim to their prize. The team is then split into pairs and sent off to different parts of the planet by some form of teleportation, which is at this point unexplained. Charlie-27 and Martinex appear first and they are met by Broadside and Brahl of Force. Martinex takes on Brahl who’s viscious nature and power of intangibility leaves Martinex badly injured with facets being blasted off his body. Charlie meets Broadside, a large and curvaceous woman who instead of seeing an enemy, sees the most handsome man she’s seen since leaving Mobius. Charlie however is a born soldier and sees only an enemy and against his better judgement strikes Broadside. IMMEDIATELY he realises that was a mistake. A shocked and scorned Broadside absorbs the gravitational mass of Mainframe’s world and hits him back, HARD. 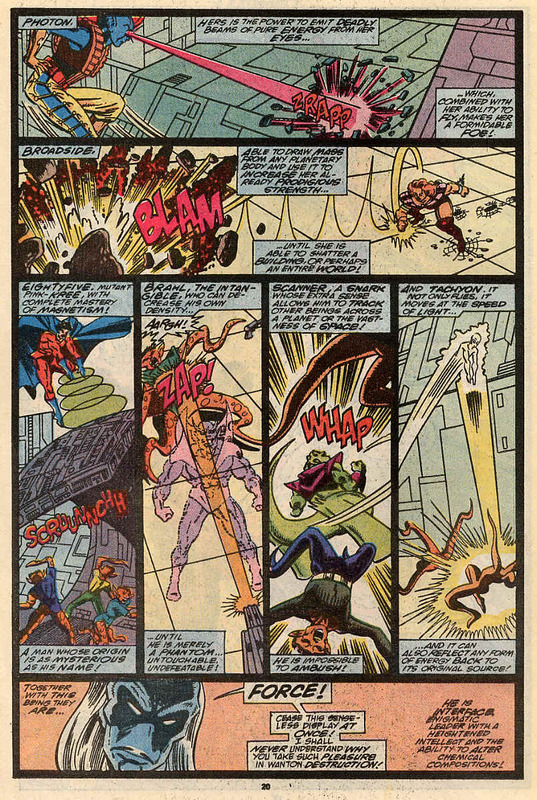 Charlie is punched through several walls and falls. Both he and Martinex are teleported to a third location. 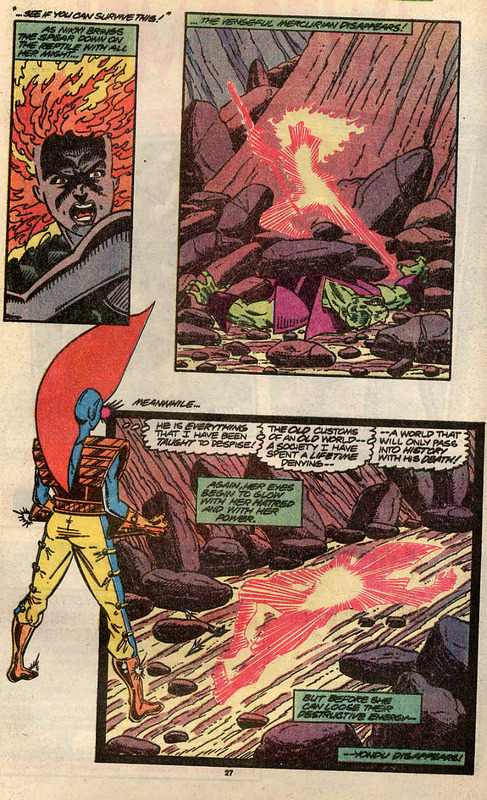 Nikki and Yondu appear outside at the bottom of a rocky canyon. Nikki looks to climb out when they are both confronted by a Centaurian female. 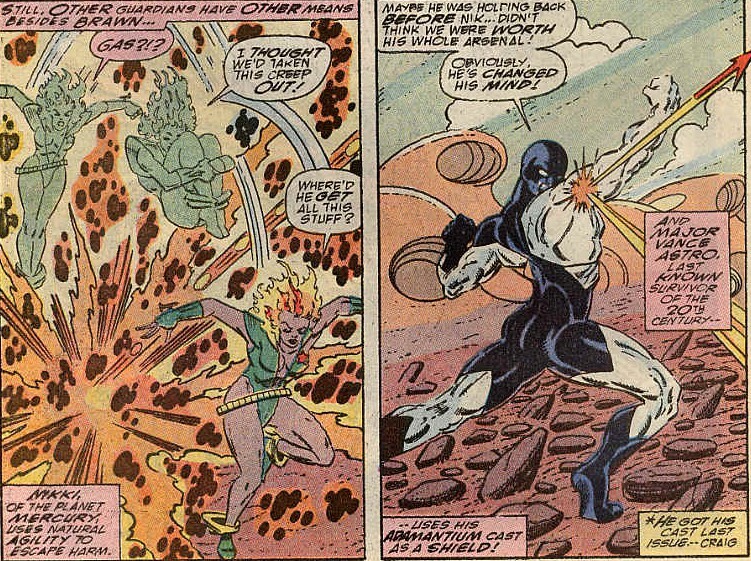 Identifying herself as Photon, she makes a lot of noise about rejecting the Centaurian way of life and her intention to kill Yondu. 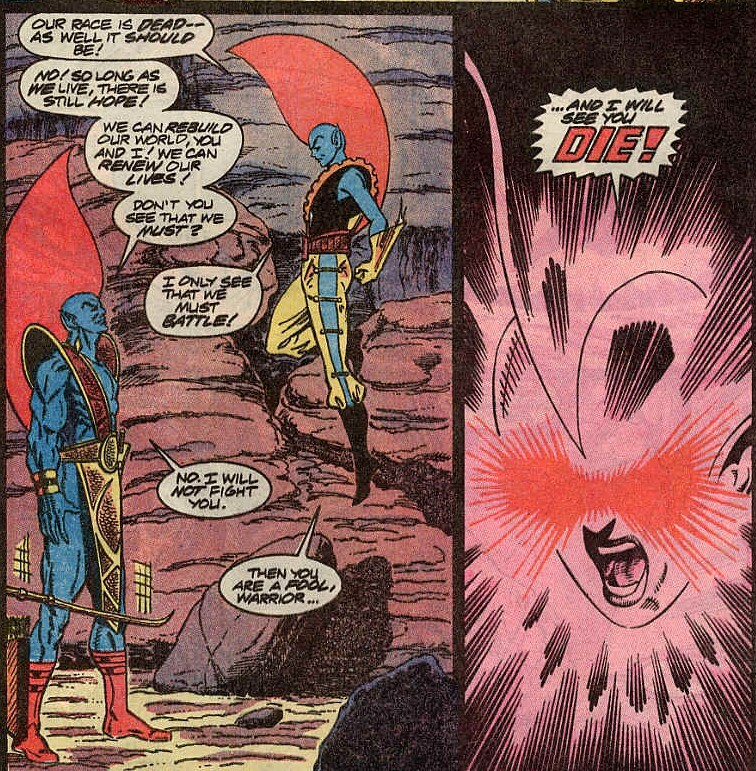 Yondu is clearly shaken by her very existence and refuses to fight and is blasted by red eye beams from Photon for his trouble. Nikki has no such qualms about her opponent, the Snark called Scanner, she’s almost gleeful at the chance to kill this reptile. 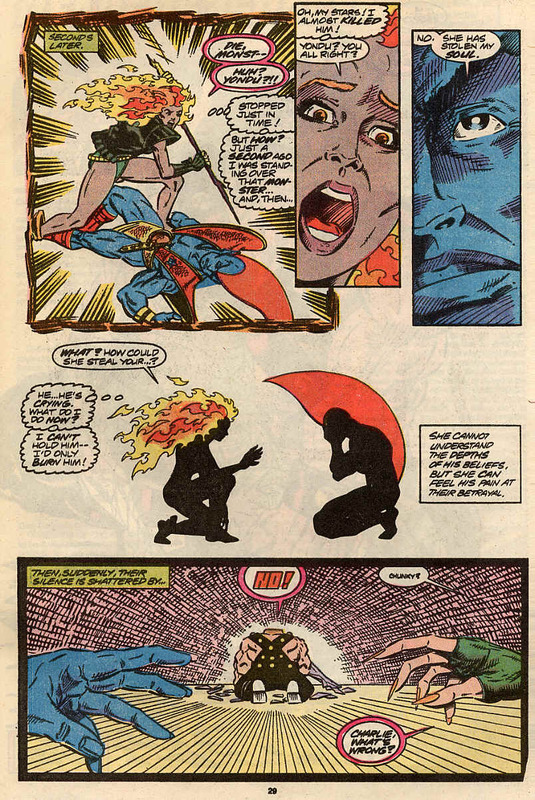 After ambushing him, Nikki tries to kill him with an improvised spear and is teleported away, finding her spear about to strike Yondu’s chest. 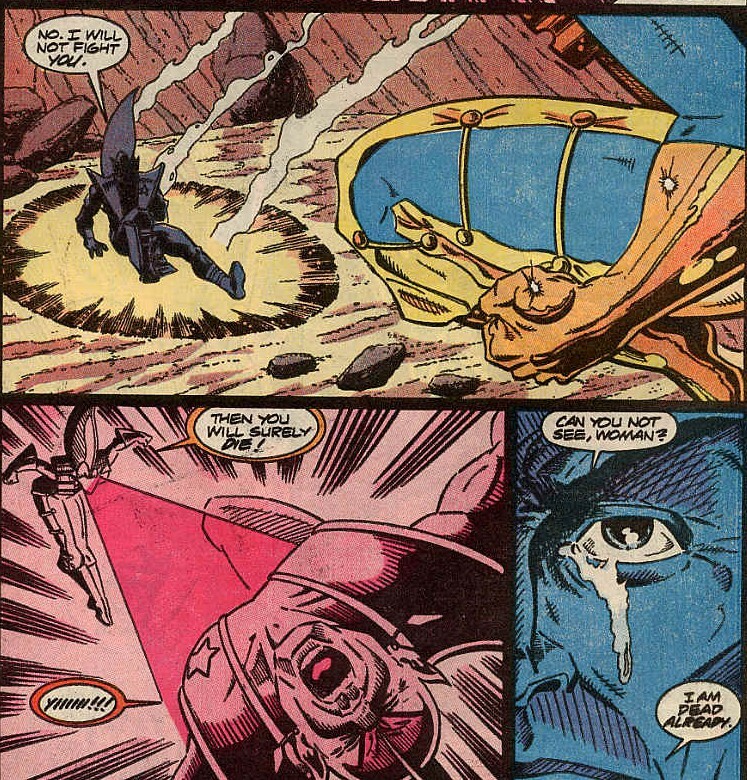 Yondu barely seems to care, heartbroken over his encounter with Photon, claiming she has taken his very soul. He begins to cry and Nikki is distraught that she can’t hold him. It’s at that point that both of them see that they’re not alone and Charlie-27 is there cradling a critically injured Martinex, who seems at the brink of death. 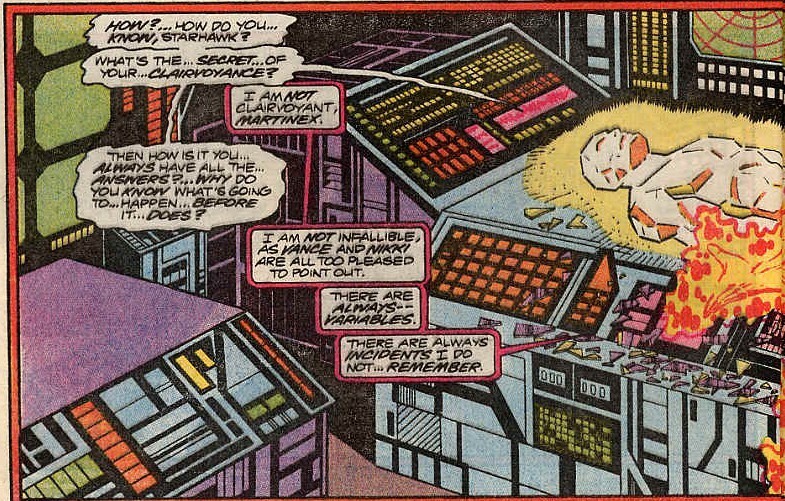 Notes: Mainframe’s world is quite a distance away from Courg and takes over a month for the Guardians to get there. A contest seems to be the best way to decide who the best team to have the shield is? Each Guardian is pitted against their opposite. The intelligent and peaceful Martinex is faced by the viscious Brahl. The disciplined Charlie-27 faces Broadside, a less committed enemy with a hotter temper. 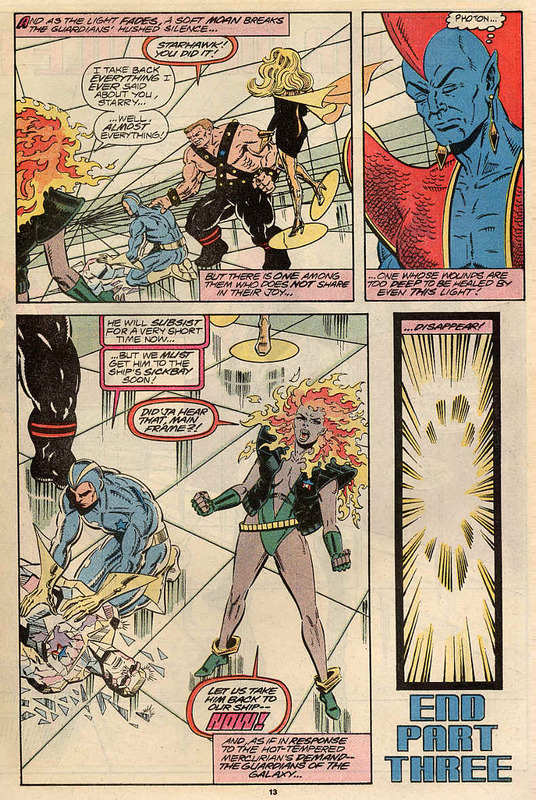 The fiery Nikki faces the cold blooded Scanner and the spiritual Yondu is met with an angry heretic, who also happens to be the last hope for the Centauri people. Yondu now wears Kospah, which are ceremonial ear-rings which are split between a couple during their wedding ceremony, she wears one and he wears the other. When a male Centauri comes of age he wears both until chosing a mate, even though he knows of no Centauri women in existence, Yondu wears them when of age, showing him to deeply respect his culture, keeping its traditions alive. 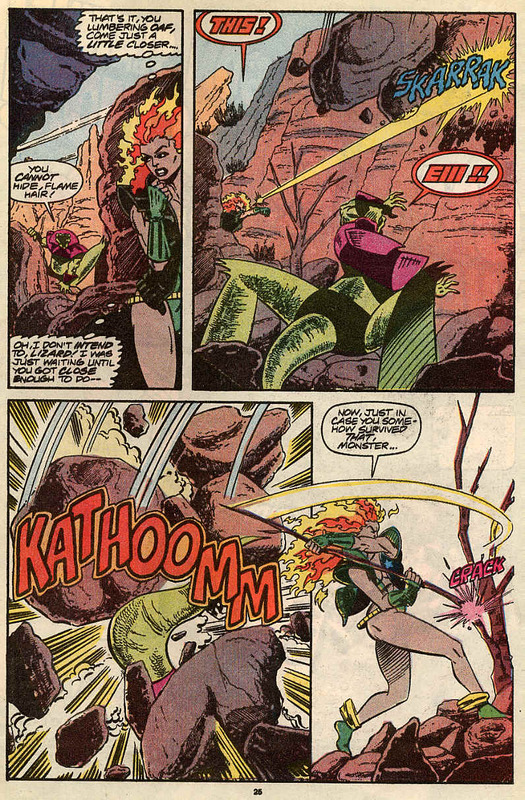 Nikki witnessed her people’s extinction by the Badoon and harbours great hatred for them, which seems to extend to reptiles of any kind, hence her reaction to Scanner. Too much of this story happens off panel. 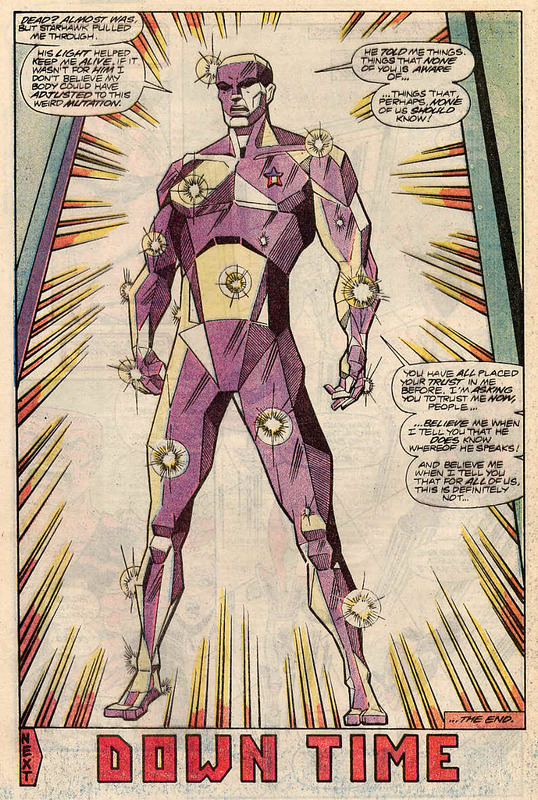 Vance has his whole body suit replaced with a thin layer of Adamantium, the ship arrives at Mainframe’s world, they beam down and begin a conversation with Mainframe all off panel. The last page of #4 and the first page of #5 is a month apart. What? Did nothing happen for that whole month? The pacing is just a little off and a lot happens in caption boxes. That said there’s a lot to like about this issue. Valentino’s pencilling is at its best here, the figure work is spot on each character having their own clearly distinct look in both hair clothes and body type. A more rounding appearance to the faces looks better than a lot of the more angular work of other artists. You learn stuff about the characters and so do they and there’s a great cliffhanger. That’s one of the strength of these mid-tier character teams. You know that Captain America will be ok and that Iron Man will recover, but on a team like the Guardians, do you know that they won’t kill off Martinex? There is a genuine sense of threat and that brings you back for the next issue. 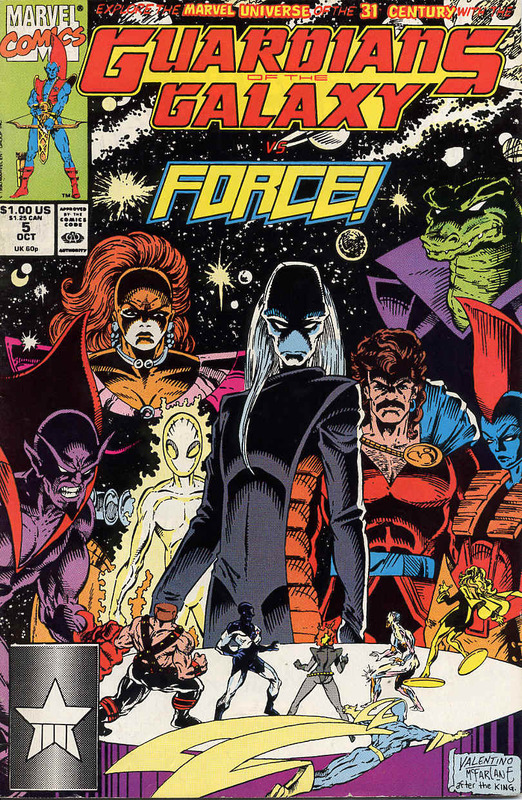 Guardians of the Galaxy #4 was cover dated September 1990 and was on sale July 1990, sharing the spinner racks with Captain Atom #44, Darkman #1, Hawkworld #4, New Warriors #3, Suicide Squad #44 and Thanos Quest #1. 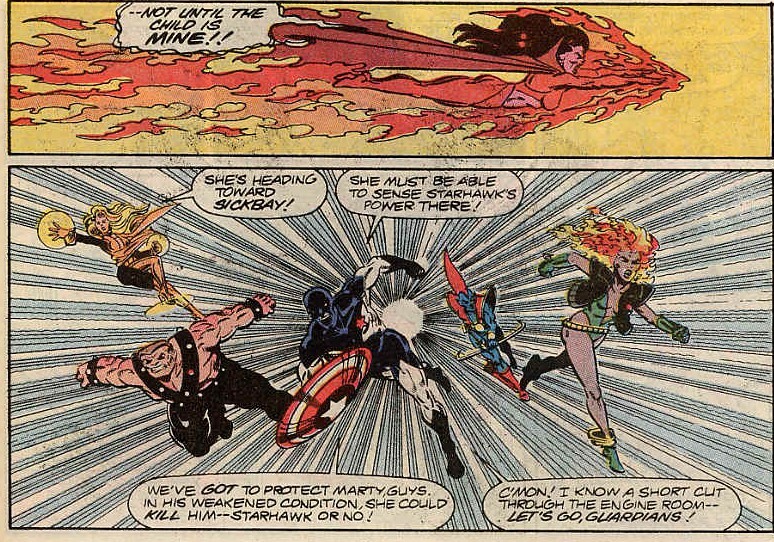 …And Then Came Firelord was written and drawn by the usual suspects of Jim Valentino and Steve Montano and opens seconds after the end of issue 3 and shows Starhawk firing at the Stark ship in orbit of Courg. 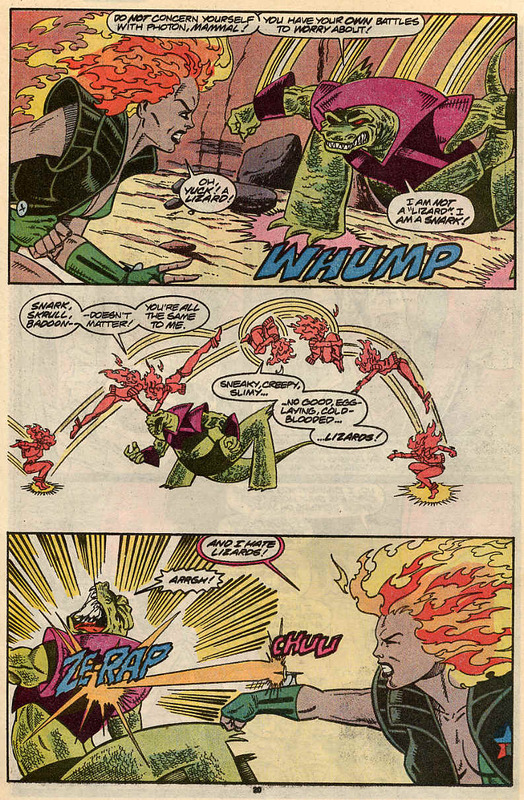 Firelord appears and in a rage also fires at the Stark ship with Starhawk stopping him and letting him know about the battle on the planet’s surface. On the planet below, the Guardians are battling a contingent of Stark soldiers and are winning. They teleported down and all made it safely, except for the Stark general captured by Charlie-27. 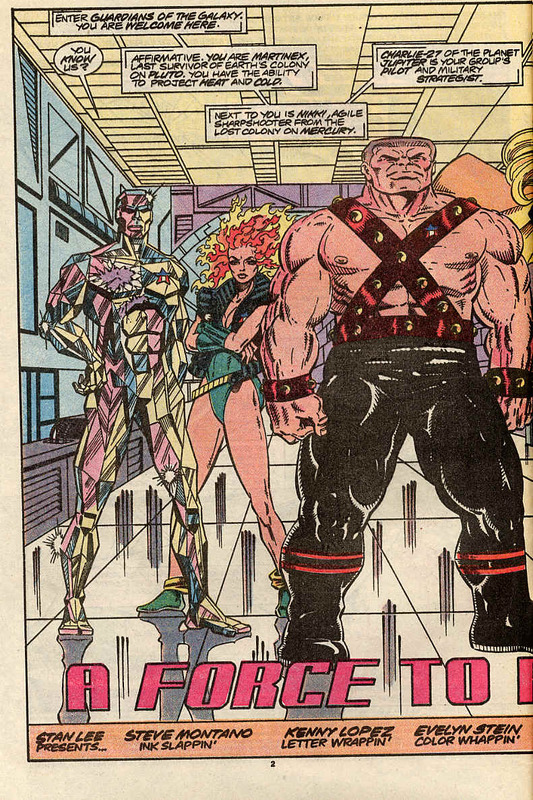 The Stark are routed, all except for Taserface ( thankfully this is the last issue I have to read that name in, I have to stop myself chuckling to type it) how goes on the offensive against the team. 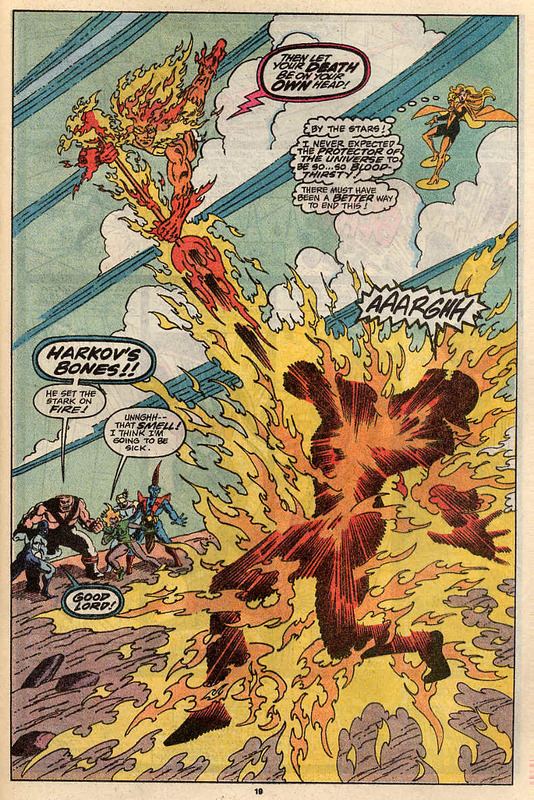 Doing well against the Guardians, just then Firelord arrives and after warning Taserface (giggle) to surrender, he burns him alive. Let me repeat this part of the show. He Burns Him Alive! But lets not linger. The scene shifts to another world and we return to Force. 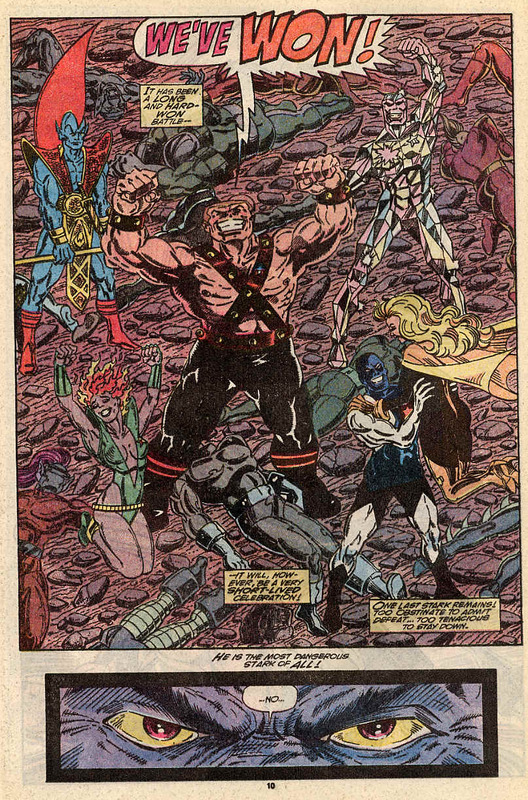 This time we get one of those names and powers pages that they used in the 90’s to introduce characters in an organic story related way. 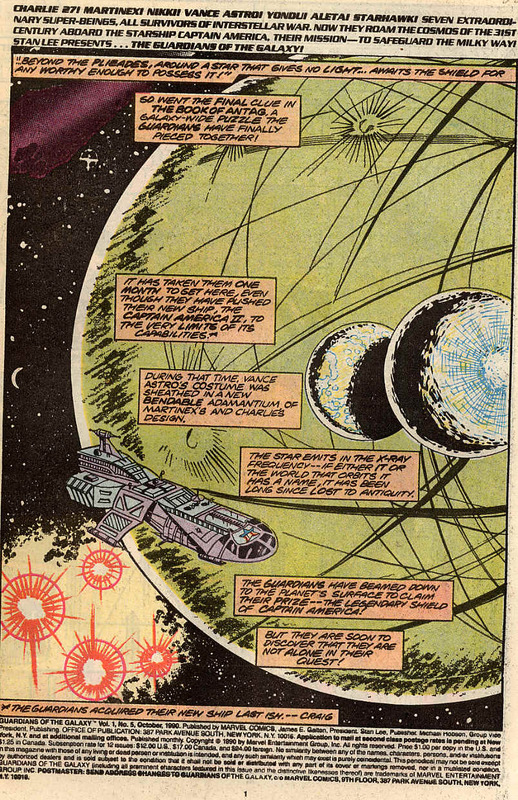 The team finds reference to the shield being on a world beyond Pleiades waiting for anyone worthy of possessing it. 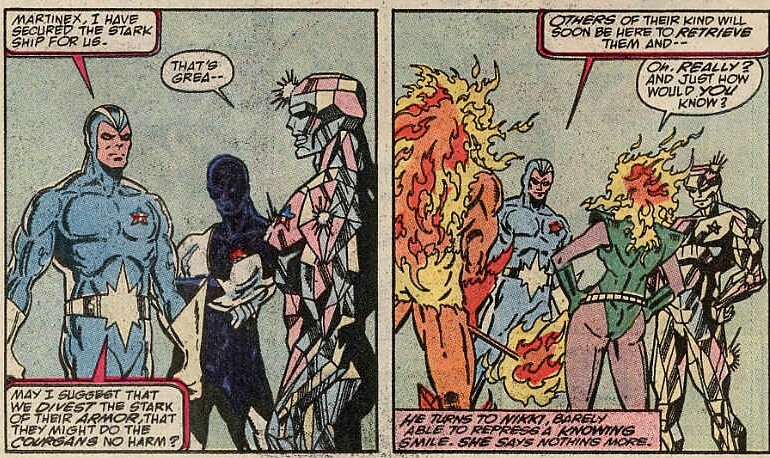 The Guardians on the surface awkwardly not mentioning the fact that there is a still smoking Stark lying ten feet away. 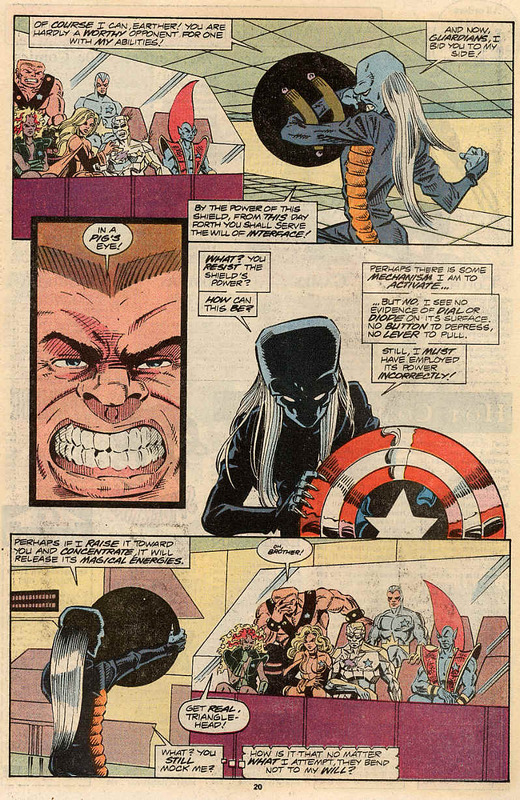 Starhawk arrives and tells them that he has secured the Stark ship and that they should disarm the Stark and then leave. Which they do, little realising Firelord’s burnt enemy is still alive and seeks revenge. 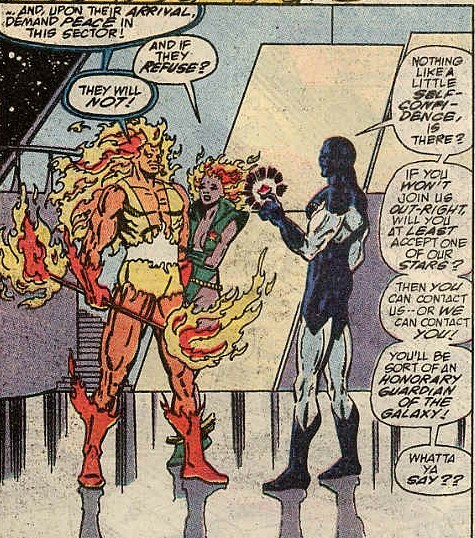 Now in command of the Stark ship, the team offer Firelord a place on the team, he declines, but accepts a star so he can keep in touch. 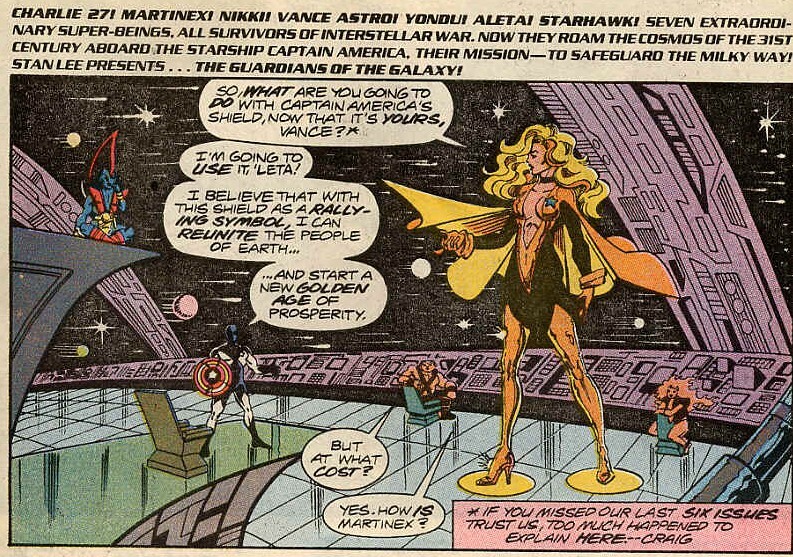 Then because we’re at the end of the story, Firelord tells them about the same place Force know about and the team head off to find the shield after naming the new ship the Captain America II. The Stark general is weirdly written out. It’s as if Valetino had written most of the story and only then realised she was missing and so added a couple of word balloons to cover. The Guardians kick some arse and clear the battlefield, while not an important story point, I still enjoyed seeing it. 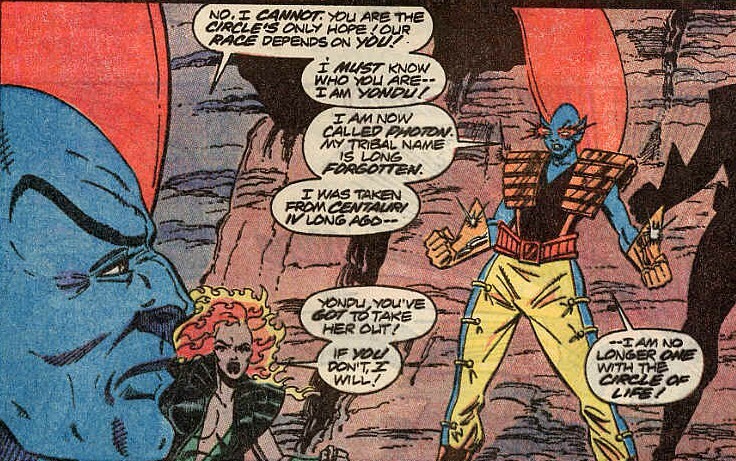 Yondu once again obsesses over the blue alien who killed Atur’s brother, but we have now learned that Photon (she of the safety pin pants) is a centaurian as well. 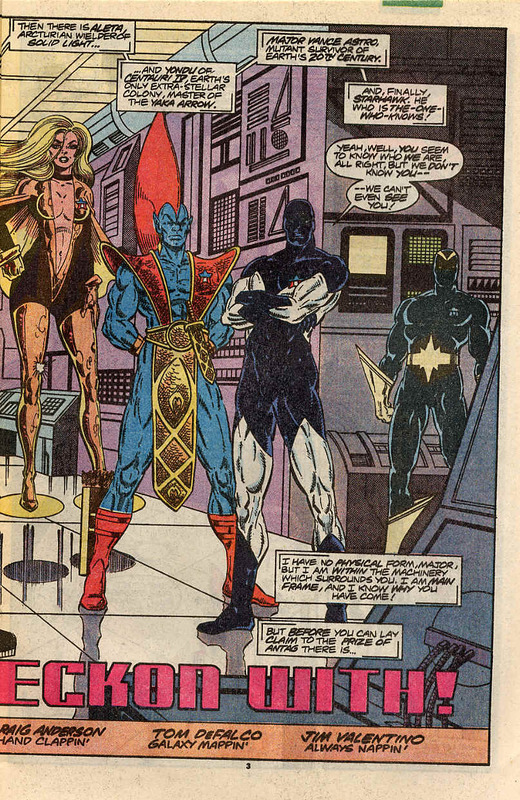 Yondu is not the last survivor of Centauri IV as originally thought. 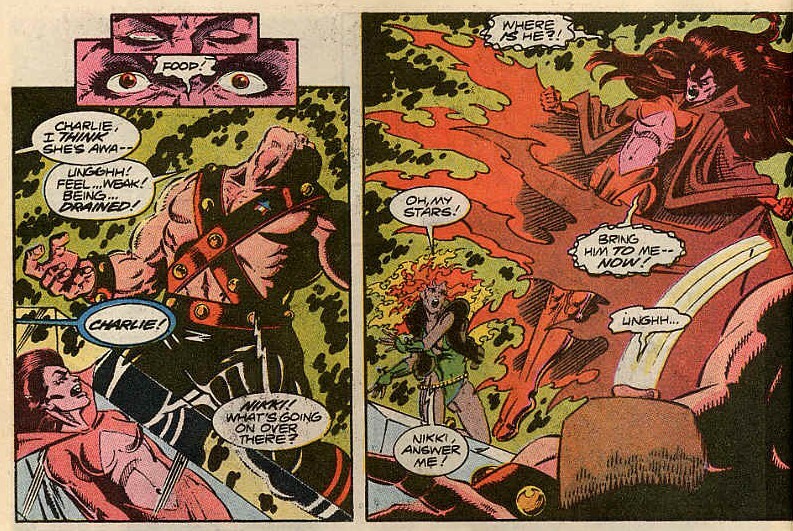 Nikki falls instantly in lust with Firelord and that just tears up Charlie-27. 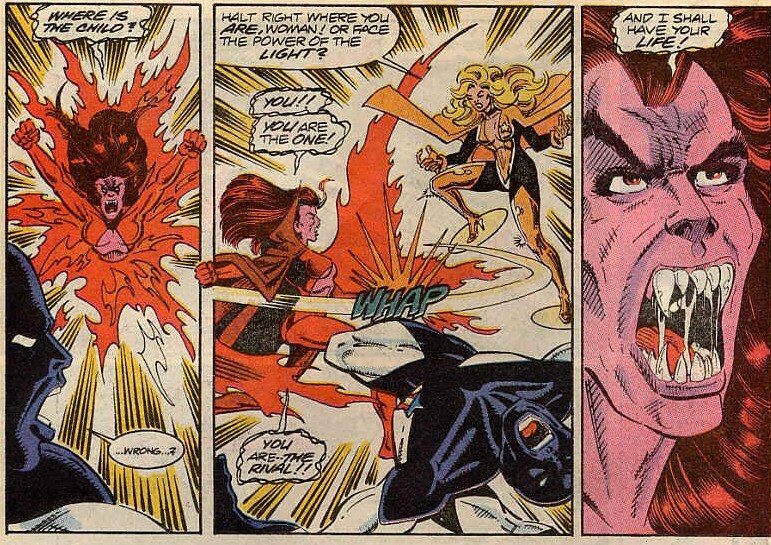 Firelord doesn’t get proportionate response. “No.” At that point, he’s burned alive and this is the less impetuous Firelord? Overall this is a good if not brilliantly paced story. 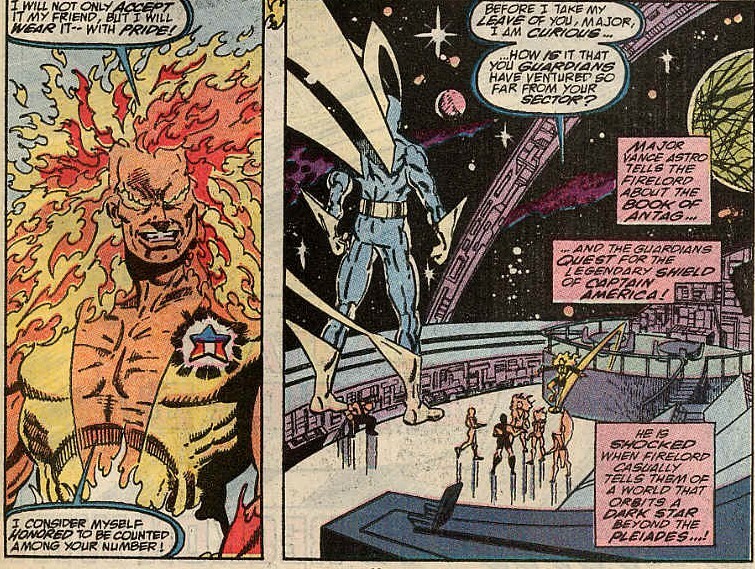 My only real gripe is that Firelord appears only to burn Taserface (giggle) and point the Guardians towards Pleiades. But the art is great, the characters have each found their voice and the stage is set for a showdown with Force.